. 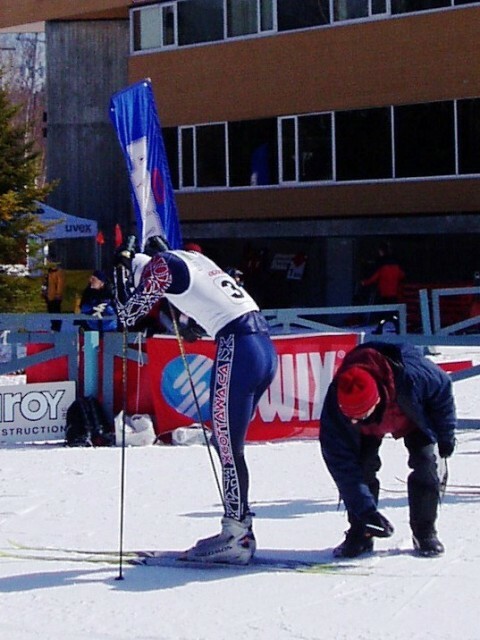 : E-Load/E-Mend Marathon Race Report: 2007 National Championship 50k/30k :: Ski XCOttawa.ca :: Skiing in Ottawa and Gatineau Park :. 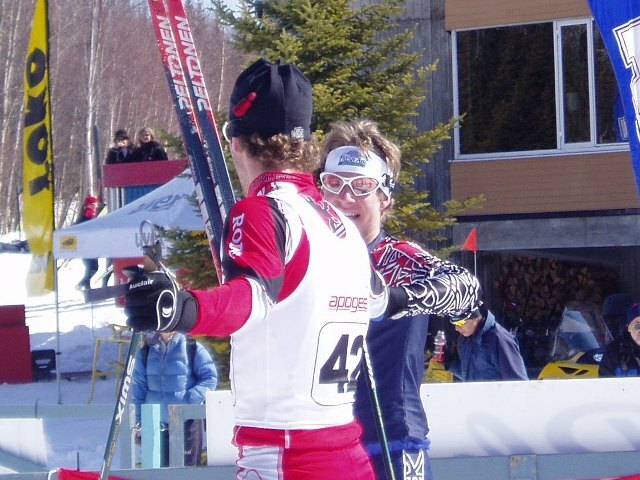 Like at all good ski racing events, the final race of the 2007 National Championships in Mont Ste-Anne was a mass start 50k for the men and a 30k for the women. This is usually made especially interesting at the end of the season, as conditions and waxes can vary immensely, with the ever-present threat of disastrous waxing causing hours of suffering for racers. Fortunately, this year was a skate 50k; no klister. Long-distance courses for non-loppets are always a compromise of visibility for spectators and officials, and avoidance of boredom for racers. The formula boils down to a maximum visibility for a minumum number of repeated laps. The course designers at Mont Ste-Anne found an elegant solution, by running a 10k lap made up of two separate back-to-back 5k loops, each beginning and ending in the stadium area. The first 5k loop was fairly simple; it consisted of a gradual, fairly sustained climb for 2.5k, followed by a gradual, fairly sustained downhill for 2.5k. The second 5k loop, on the other side of the stadium, was the same as Wednesday's classic course; a rolling loop, with a mix of short steep and more gradual climbs, generally beginning climbing and finished on downhills. Our race preparation started the night before, with a massive feed-making party. In races like this, rather than carry a water bottle with us racing we give much smaller bottles to the coaches, who wait at designated areas and give them to us on the fly. 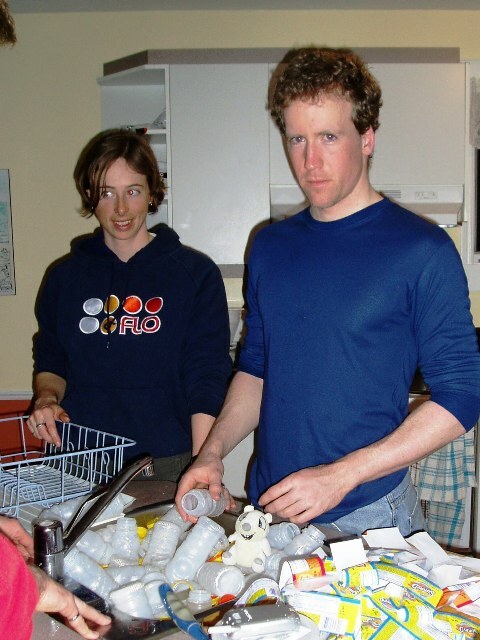 The accepted frequency of one feed every 15 minutes, or every 5 k, meant 9 feeds per man and 5 per woman; multiplied by 8 men and 2 women, this meant preparing a heck of a lot of feeds. Oddly enough, the ideal bottles for feeds are those Sunny Delight is sold in. Unfortunately, Sunny D can kill a cow at 15 feet, and before filling feeds we had to wipe out about 80 bottles of the stuff. Brian and Gavin made valiant attempts to drink it and save it, but I'm sorry to say that the St-Ferréol-des-Neiges sewer system will be well-lubricated with vegetable oil for a while yet. Take note: there may be a market in feed bottle production. Upon feed bottle washing, an efficient production line was set up to fill all the bottles with a communally acceptable mix of E-Load. Finally, mission accomplished, we were ready to get down to business. The day of the race dawned bright and clear. The week's weather predictions had us worried about knee-deep slush, but an overnight freeze left hard trail and a morning temperature below -10. 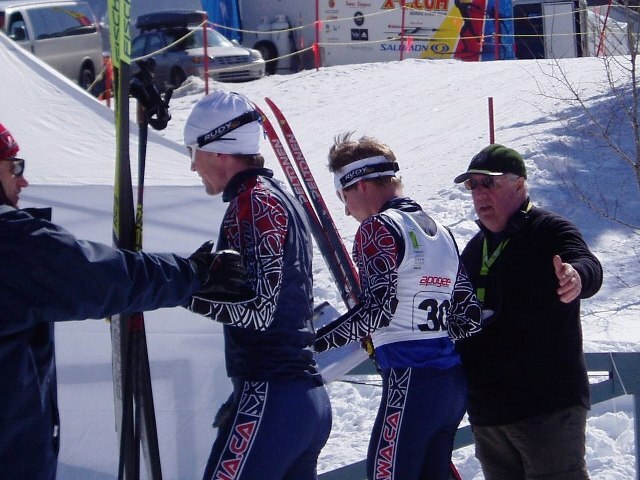 We didn't have to worry too much about wax; our dream team of techs, led by coach John and filled out by Judy Conliffe and Liam Watson, had everything well under control. 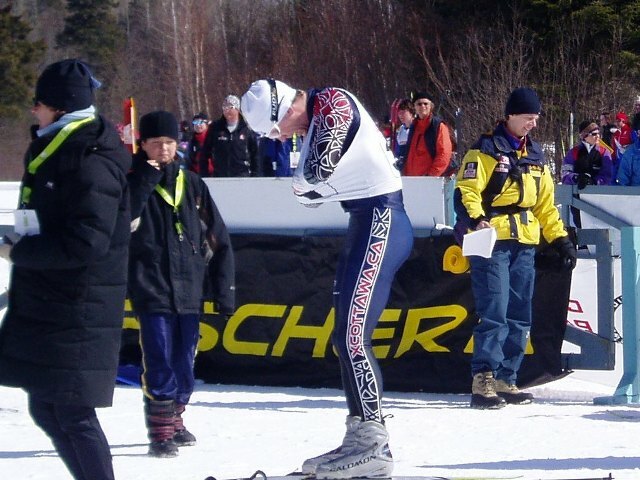 Despite the cold morning, by the time the men started, 10 minutes before the women, the field was starting to roll up ski suit sleeves in the strong sunshine. The start was generally fairly clean, with a minimum of broken equipment, and none of it XC Ottawa's this time. The leaders took the pack out at a reasonable pace, and it started gradually breaking into groups over the first lap. Leaving aside the hurt and fatigue usually associated with long distance races, it was one of the most enjoyable races of the year. The weather was perfect, soaring from -3 to about 5 degrees during the race, with not a cloud in the sky. The course got softer, but held up quite well, and there were plenty of spectators in the stadium and on the course. In addition, the E-Load feeds went very smoothly, so we largely managed to avoid bonking. Tom at the end of 50km. Tom demonstrating that after a 50km race, the little things are really hard. Tom and Gavin, 21st and 22nd. Chris Mamen and Brian Suke. 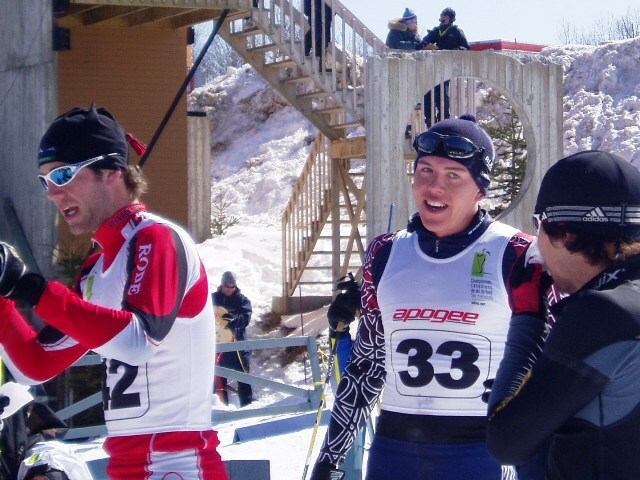 Race Report: 2005 National Championships Report #3: Pursuit Skate.